The email is short and sweet and provides great tips for using ShortStack (and other platforms) to build a social media following that’s more likely to convert. ShortStack has given me permission to share the content of Jim Belosic’s email, and here it is. Even if your business is killin’ it on Facebook, Instagram and Twitter, loads of followers doesn’t always equal loads of sales. ShortStack can help you build a social media following that’s more likely to convert to loyal customers. How? Let’s face it, keeping your social media pages stocked with engaging content is a lot of work. Why not put that effort toward attracting followers who are more likely to convert to customers? Conceptualize a contest, giveaway or quiz that would intrigue your ideal customer. Then select the right prize to motivate them to participate. The right prize will be something related to your business and relevant to your target audience, not just something expensive and shiny (remember all those iPad giveaways?! 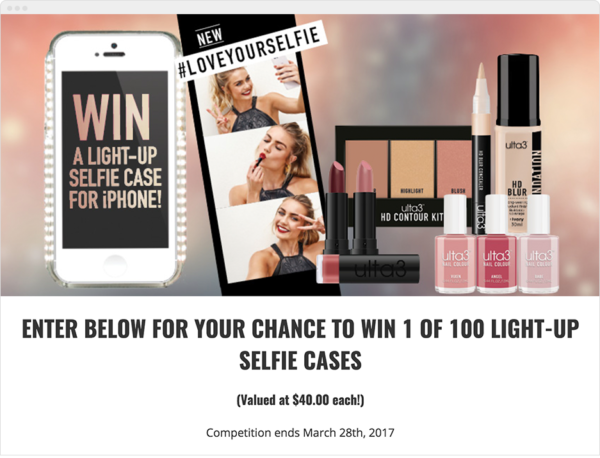 )In the example below, Ulta is giving away 100 light-up phone cases — a prize that’s perfect for selfie lovers. This prize is relevant to the contest, and to their brand – targeting participants who are patrons of makeup and beauty supplies and therefore likely to become future Ulta customers. Build the contest, quiz or giveaway. Start by scrolling through our gallery of templates – and find one that’s just right for you. You can ask participants to Like or Follow you as a part of the contest or giveaway, but you can’t require it. That’s nothing to worry about, though, because the right people will be happy to click that Follow button. Promote the contest/giveaway, etc. on your website and social media channels. Use our Refer-a-Friend feature to incentivize sharing by offering extra chances to win for each referral participants are able to get. Repeat! Running regular contests and giveaways can help you keep current fans and followers engaged while continuing to build a larger audience. Don’t stop after running one contest or giveaway, implement this strategy all year long. Check out this complete 12 Month Marketing Plan for contests, giveaways and promotions. Customer acquisition can be expensive and challenging for any business. Using a smart approach to building your audience can create a social media following that’s a lead-generating gold mine. Click here to sign up for ShortStack’s free newsletter. For other great tips on how to build a social media following that’s more likely to convert check out ShortStack’s blog.